This offseason, MiLB.com is taking a look at the most outstanding campaigns by players in each system across Minor League Baseball and honoring the players -- regardless of age or prospect status -- who had the best seasons in their organization. The Phillies feel about ready to pop. The club finished in the National League East basement for the third time in four seasons with a 66-96 record in 2017. However, this period of Major League ineptitude has been part of a rebuilding phase in Philadelphia, and that rebuild began to bear fruit in earnest with the arrival of top prospects Rhys Hoskins, Nick Williams, Jorge Alfaro and J.P. Crawford on the game's biggest stage. There's certainly more coming, especially in the way of young pitching. Sixto Sanchez, Adonis Medina, Ranger Suarez and JoJo Romero enjoyed special seasons at the lower levels, and the addition of No. 8 overall pick Adam Haseley gives the system six top-100 prospects. The first wave might be arriving, but more is to come. As an organization, Phils affiliates finished fifth among the 30 farm systems with a .531 winning percentage. Triple-A Lehigh Valley (80-62), Double-A Reading (72-68), Class A Lakewood (73-66), Class A Short Season Williamsport (37-37) and the GCL Phillies (36-22) were all domestic clubs that finished with records of .500 or better. Catcher -- Juan Mendez, DSL Phillies White (39 games): The Org All-Stars picks are generally kept stateside, but -- Alfaro's prospect status aside -- it was a fairly weak crop of backstops in terms of 2017 production. Even if it was stronger, Mendez's output in his native Dominican Republic may have been too good to ignore. The 18-year-old left-handed hitter produced a .379/.411/.571 line with three homers, seven triples and four doubles in 39 games. His 176 wRC+ was the highest among any Minor League catcher or any Dominican Summer Leaguer, regardless of position, with at least 105 plate appearances. He also threw out 43.8 percent of attempted basestealers. At the least, it should be interesting to see how he can translate that dominance to the mainland. 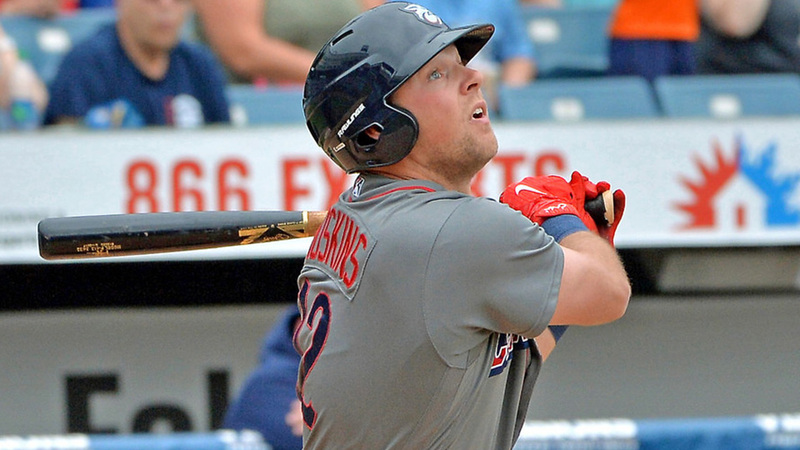 First baseman -- Rhys Hoskins, Lehigh Valley (115 games), Philadelphia (50 games): The baseball world fell in love with Hoskins as he went deep 18 times after being called up on Aug. 10. But don't forget how prodigious he was with Lehigh Valley before reaching the bigs. Despite missing the final month of the International League season, Hoskins finished third with 29 homers and 233 total bases in 115 games with the IronPigs. He still had enough at-bats to lead the circuit with a .581 slugging percentage and .966 OPS -- no other qualifier posted one above .863 -- and rank second with a .385 OBP, making him an easy pick for IL MVP and Rookie of the Year. Following a breakout 2016 at Double-A Reading, Hoskins managed to improve by cutting down on his strikeouts (from 21.2 percent to 15.8 percent) while maintaining the power. Understanding his offensive potential, the Phillies gave him time in left field to make sure his bat would get in the lineup, though most agree he's best suited for first base. No matter, Hoskins has molded himself into one of the Majors' most exciting young bats. "What this guy has been able to do over three [full] seasons in the Minor Leagues is figure out a routine, develop a routine," Phillies director of player development Joe Jordan said. "He's become much more athletic. That's the culmination of a lot of physical work, but he's also a student of the game. He takes his craft seriously and is always working to get better. Things definitely came together this year with all that work and development. He's the real deal." Second baseman -- Scott Kingery, Reading (69 games), Lehigh Valley (63 games): If it wasn't for Hoskins, Kingery likely would have been the success story of the season in this system. The 2015 second-rounder out of the University of Arizona became a surprise power hitter with a jump from five homers in 2016 to 26 in his second full season. For those thinking that his numbers might have been inflated by homer-friendly environs in Reading, know that his home splits at Double-A (.317/.375/.620, 10 homers in 36 games) weren't too far off those on the road (.309/.383/.596, eight homers in 33 games). Beyond the increased power, Kingery continued to show impressive speed with 29 steals between his two stops and was awarded a Minor League Gold Glove for his work at the keystone. After starting the season out of the top 100, he's MLB.com's No. 49 overall prospect and tops the second baseman category. He also got brief looks at shortstop and third base, and a promotion to Philly to play on the dirt in some capacity early in 2018 is likely. "It's obvious that the power dimension of the game is what's started to separate him from some of the other guys at his position," Jordan said, "but Scott Kingery can do a lot of things anyways. He's a premium defender, a premium baserunner. His plan got better at the plate. He did a better job of getting into position, catching the ball up front, helping his ability to elevate. He made some adjustments, but we saw those even when he first arrived." Third baseman -- Damek Tomscha, GCL Phillies (four games), Clearwater (57 games), Reading (48 games): The 2014 17th-rounder has been here before; he was a Phillies Org. All-Star in 2015 after his first full season at Class A Lakewood. Two years later, he's back after leading full-season Phils prospects with a .307 average in 109 games. He added a .386 OBP, .439 slugging percentage and career-high 11 homers. The right-handed slugger also saw time at first base and left field but was left unprotected from the Rule 5 Draft. Shortstop -- J.P. Crawford, Lehigh Valley (127 games), Philadelphia (23 games): This is the third time Crawford has been named an Org. All-Star, and it's likely to be his last, following a Major League promotion in September. It was far from given that he'd be here, however. After struggling at Triple-A in 2016, the 22-year-old shortstop was hitting .194/.313/.252 with two homers through June 10 before a groin strain kept him out for 10 days. He caught fire upon his return, producing a .280/.381/.522 line with 13 homers, five triples and 16 doubles in his final 71 games with the IronPigs before his contract was purchased on Sept. 5. The left-handed hitter's 15 homers easily trumped his total of 11 in 2014 for a new career high. "When he took some time off for the groin, that was an opportunity to assess where he was at," Jordan said. "He got with the staff at Lehigh, thought things over because he was kinda lost. That was strange because this was a guy who always controlled the strike zone everywhere he went. I think with J.P. we could tell really quickly that he was back. The ball was coming off his bat so much faster. I think he just needed to barrel some balls again to get his confidence again, and he took off." Like so many others on this list, Crawford got looks at positions away from his natural spot, namely second and third, but with his range and arm, the only thing keeping him from sticking at short in the short term is Gold Glove finalist Freddy Galvis. Jhailyn Ortiz, Williamsport (47 games): The Phillies' 19th-ranked prospect was known for his power when he signed for $4 million out of the Dominican Republic in 2015, and at listed 6-foot-3 and 215 pounds, it's not hard to see why. But in 2017, Ortiz developed into a fairly well-rounded hitter during his summer in the New York-Penn League. The 19-year-old hit .302/.401/.560 with eight homers, a triple and 15 doubles in 47 games. Though he fell about a dozen plate appearances shy of qualifying for any major categories, he posted the NYPL's second-highest wRC+ (185) among batters with at least 180 plate appearances. "The big thing was he started to understand the strike zone better," Jordan said. "All good hitters say no a lot. He just needed to learn that. He's young but took a huge step forward. When he doesn't get too aggressive, he does things in the box not many can, especially at his age." Andrew Pullin, Reading (67 games), Lehigh Valley (67 games): The 24-year-old, who retired briefly early in 2016, is here for a second straight season because he collected 66 extra-base hits between the system's top two levels. That was tied for fourth-most in the Minors and more than both Kingery (63) and Hoskins (57). But it was a season of two halves for the left fielder. Pullin hit .308/.368/.556 in his return to Reading but saw those numbers drop to .231/.280/.412 over an equal number of games with Lehigh Valley. For those thinking FirstEnergy Stadium had something to do with the dichotomy, know that Pullin actually performed better on the road during his Double-A stay, hitting .353/.408/.669 with nine of his 14 homers. Jordan believes the Triple-A struggles were a teachable moment. "I think the first half of 2017 was just an extension of the second half of 2016 for him," he said. "But when he went to Triple-A, what happened to him is what happened to a lot of guys there. Pitchers figured out that he would get himself out. He was working out of the strike zone. Without a question, he will be a good hitter, but he needs to learn from that first." Nick Williams, Lehigh Valley (78 games), Philadelphia (83 games): There were few who doubted Williams would be a Major Leaguer some day -- the bat speed was just too great. But what kind of impact could he make at the highest level? As it turned out, a pretty solid one. The 24-year-old went from looking like an average Triple-A player in 2016 to a well-above-average one in his return to the IronPigs, hitting .280/.328/.511 with 15 homers in 78 games before moving up on June 30. The 15 dingers were two more than he had the year before in 47 fewer games. Williams went on to bat .288/.338/.473 with 12 long balls for Philly the rest of the summer and is penciled in as the Opening Day right fielder. An overly aggressive approach remains an issue, but a power jump with 27 total homers bodes well. Designated hitter/utility -- Darick Hall, Lakewood (114 games), Clearwater (seven games): In most other systems, Hall would be a no-doubt choice for the first base spot. The 2016 14th-rounder set Lakewood records with 27 homers and 96 RBIs in 114 South Atlantic League games. No one else in the circuit hit more than 17 homers. He also was the league leader in total bases (227), slugging (.533) and OPS (.872), despite playing in Lakewood in a notorious pitchers' park. Seriously, 20 of his 27 homers came in 59 road games. The left-handed slugger added two long balls in Clearwater to tie Hoskins for the organizational Minor League lead. "The thing we've always loved about Darick is that he's an aggressive hitter looking to do damage," Jordan said. "The bat speed is obvious, so is the power. No one ever did what he did at Lakewood. That speaks for itself. But pull, middle, opposite field, he's hitting them everywhere. I don't know what else there is to say, other than it was a heck of a year." Right-handed starting pitcher -- Tom Eshelman, Reading (five games), Lehigh Valley (18 games): When it comes to the 23-year-old, it's always a good idea to start with the walks. Eshelman issued only 18 free passes over 150 innings between his two stops in 2017. In the International League, in particular, he walked only 2.8 percent of the batters he faced, lowest among any qualified Triple-A arm. But his dominance at the Minors' top level didn't stop there. The Cal State Fullerton product led the IL with a 0.94 WHIP and ranked second with a 2.23 ERA over his 121 frames with the IronPigs. The strikeout numbers don't quite match up with that of a dominant starter, but the Phils couldn't have been happier with what they saw from Eshelman. "Esh knows who he is and makes it work so well," Jordan said. "He reads batters' swings and figures out their weaknesses so quickly. He knows immediately where to attack. You look at all the metrics and his stuff plays so well above the radar gun. He hides the ball, has that deception, too. The velocity doesn't tell the whole story. ... He just needs to keep doing what he's doing, wait for his [Major League] opportunity. That's all he needs to do now." Left-handed starting pitcher -- JoJo Romero, Lakewood (13 games), Clearwater (10 games): There's a definite case to be made for Suarez, but Romero gets the nod for how consistent he was across two levels in his first full season. The 2016 fourth-rounder put up a 2.11 ERA, 2.66 FIP, 26.3 percent strikeout rate and 7.0 percent walk rate over 76 2/3 innings at Lakewood. Even after making the jump to the Florida State League, his numbers were eerily similar -- 2.24 ERA, 2.91 FIP, 23.3 percent strikeout rate, 7.1 percent walk rate. The former junior college standout has moved up from No. 26 in MLB.com's preseason rankings of Phillies prospects to No. 15. "Good pitchers know what to do with their pitches. It doesn't matter how tall or big," Jordan said of the 6-foot southpaw. "He can execute a 93 mph sinker really well. The four-seamer is around 94-96. He's got the cutter, the change, a breaking ball. ... He's as athletic as any pitcher we have. You could see that he has a lot of durability, and he became much more efficient with his delivery. It was fun to watch." Relief pitcher -- Jesen Therrien, Reading (21 games), Lehigh Valley (18 games), Philadelphia (15 games): The 2011 17th-rounder broke out with the types of numbers Minor League relievers need to make it to the big leagues. Therrien posted a 1.41 ERA, 0.84 WHIP and .191 opponents' average with 65 strikeouts and nine walks over 57 1/3 innings between two Minor League stops. Finding those numbers and the improved fastball and slider behind them too good to ignore, the Phils gave the 24-year-old right-hander his first callup on Sept. 11. That's where things took a rough turn. Therrien surrendered 17 earned runs over 18 1/3 innings in the Majors, suffered an elbow injury that required Tommy John surgery and elected free agency after being outrighted off the 40-man roster. According to Montreal journalist Jeremy Filosa, Therrien has signed with the Dodgers, but it'll take some time before he's on the mound again. At least, he'll have his 2017 success on which to build. "What Jesen did this year, a lot came down that the command of his fastball was better than it had been in his Minor League career and his slider was as good a one as you can see," Jordan said. "I mean, the slider became an absolute finish pitch. Hitters couldn't see it. I don't know if it was the time leading up to the arm injury or what, but he just didn't execute as well in the Major Leagues. It wasn't about the stuff. But now it'll be on him to try and get healthy and show that again."